by Mir at 11:11 am on October 19, 2018 in Hot Hot Hot! If you know me in my outside-the-computer life, you know I’m not a huge makeup person. I wear makeup for stage and the occasional dressing-up event and most of the time I can’t be bothered. But when I do buy makeup, I tend to buy the good stuff. 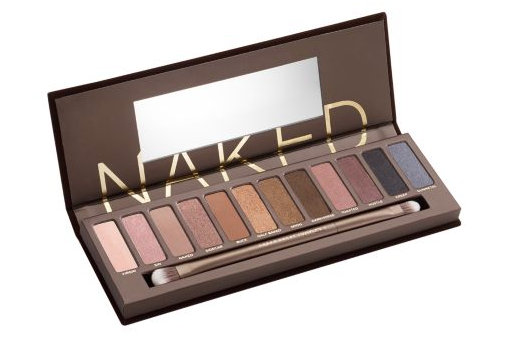 I’m not entirely sure why Urban Decay is about to discontinue one of their most popular Naked eyeshadow palettes, but I know that I’ve been trying to justify the cost of one for forever and today’s the day I bit, and here’s why: Right now Belk has the original Naked palette available for half-price (just $27, vs. the regular $54), and—confusingly, but I’m not complaining—while the beauty coupon advertised on the site cannot be applied for an additional discount, coupon code BELKDAYS20 can be used for an additional 10% off. Shipping on Beauty is automatically free, so you’re scoring the only fancy eyeshadow palette you’ll ever need for about $24 to your door. Now, I like the new Naked palettes, too, but 1) to my mind, this is the most versatile set of neutrals they’ve ever made and 2) I’m sure not ever going to pay $54, so, win-win. Thanks Mir! I just ordered this. I’ve always wanted it, but never wanted to spend $54 either! Now the dilemma becomes – do I selfishly keep this for myself? Or do I give it to the teen for Christmas?